8th Mars Report: Was Ancient Mars Warm and Wet or Cold and Icy? Two weeks ago, more than 650 Mars scientists from around the world gathered in Pasadena, CA to attend the Eighth International Conference on Mars. According to the meeting website, the inaugural International Mars Conference was held back in 1973 when data were first being returned from Mariner 9. Seven more International Mars conferences have been held since that time, and the last conference took place in 2007, only a year after the Mars Reconnaissance Orbiter (MRO) entered Martian orbit and three years after Spirit and Opportunity landed. A lot has happened in the last seven years -- including the successful landings of Phoenix and Curiosity, continued operations of Opportunity, and terabytes more data returned from the Martian orbiters -- so the time was ripe for the Mars science community to once again gather together to discuss the current state of knowledge about ancient and modern Mars. Three of these “big picture talks” were presented on the conference’s second day in a session focused around the question of whether Mars’ climate 4 billion years ago was warm and wet or if it was cold and dry. These talks were particularly interesting to me because the each speaker used a completely different type of evidence to address this singular question. First up was Bethany Ehlmann, who presented a viewpoint based on the kinds and abundance of minerals that have been found on Mars. Bethany began her talk by explaining that the Seventh Mars conference occurred at time after scientists had first discovered orbital evidence for extensive deposits of minerals that form through the interaction of water with rock, so their presence showed that there must have been a lot more water on Mars early in its history. Surprisingly, while many of these minerals were often found with the walls, floors, and ejecta from impact craters (or as my graduate school advisor likes to call them, “nature’s drill holes!”), they were not often associated with features like channels and deltas that were most likely carved by flowing water. Because of this finding, the question of whether the most abundant of these mineral-forming waters flowed freely on the surface of Mars or in its subsurface was unresolved. 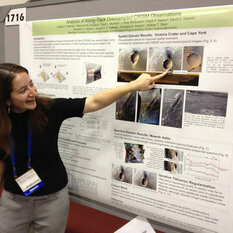 Since 2007, scientists have mapped the locations of hundreds more deposits of minerals that indicate interaction between rock and water using the CRISM and OMEGA instruments on MRO and Mars Express, and this work has greatly increased our understanding of the locations and possible kinds of environments the water-rock interactions took place. These two maps compare what was known about water-related minerals on Mars in 2007 and 2014. Figure from the Bibring et al. 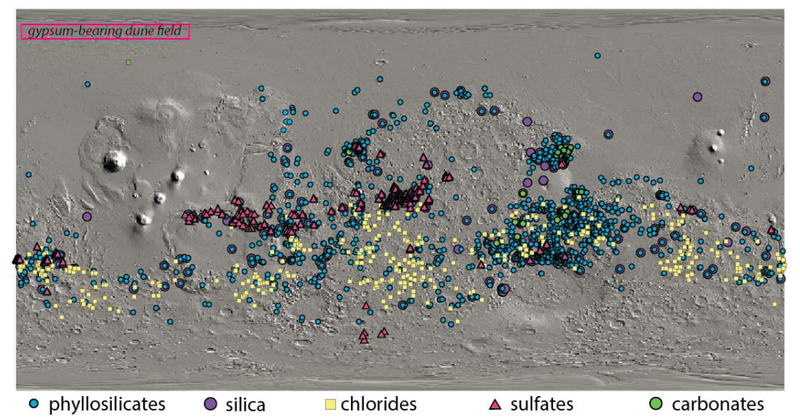 (2006) Science paper showing types and locations of alteration mineral at the last Mars conference in 2007. Red = phyllosilicates, blue = sulfates, yellow = other hydrated minerals. Figure from Ehlmann et al. (2014). It turns out that the most prevalent type of minerals in the oldest Martian crusts are clay minerals with the (in my personal opinion) awesome sounding name iron/magnesium smectites. Mapping with CRISM and OMEGA showed that these kinds of clays are most often found in association with impact craters. While iron/magnesium smectites do form through the interactions of rock with water, Bethany explained, you don’t necessarily need a whole of water to form them. Furthermore, this water doesn’t need to leach and move a lot of cations around. This kind of weathering is called “closed-system” weathering. Another kind of clay mineral on Mars that was found much less frequently by CRISM and OMEGA were aluminum-rich clays. In contrast to the iron/magnesium smectites, this type of clay mineral requires a lot more water flowing and carrying cations around the environment to form, or “open-system” weathering. The extensive mapping showed that in almost every case where aluminum-rich clays were discovered, they were on top of the iron/magnesium smectites in layered, sedimentary sequences rather than in the crust exposed through impact craters. Bethany additionally pointed out that there have been very few detections of the mineral carbonate, which is expected to form when water weathers rock in contact with a carbon dioxide-rich atmosphere. Overall, all these lines of evidence seem to indicate most of the interactions between water and rock in the earliest times in Mars’ history may have happened in the subsurface, out of contact with the atmosphere. This scenario explains why the oldest clay minerals are generally those that can be weathered in a closed system and are found exposed in impact craters. The rarer aluminum-rich clays that require lots of water and open, flowing systems for form only formed later in Mars’ history, and this scenario suggests early Mars only needed a few, transient warm and wet climates to explain the mineralogy we are able to see on present day Mars. Next up was Nicolas Mangold to present the perspective of ancient Mars’ climate using geomorphic evidence. This discovery of channels and valleys on Mars’ surface back in the days of the Mariner 9 orbiter was one of the first pieces of evidence to suggest that in past Mars may once have been warm enough to support liquid water on its surface. Over the last seven years, extremely high spatial resolution cameras orbiting Mars like Mars Reconnaissance Orbiter's CTX and HiRISE, and Mars Express' HRSC, have provided a more detailed picture of the locations and specific shapes of these fluvial (water-carved) features, all of which has better helped place the timing and mechanisms of their formation into a global context. One kind of water-carved landforms found see on Mars are long fluvial valleys, and these features are most often associated with old Martian crust (~4 – 3.7 billion years old). While some scientists proposed these valleys could have formed by sapping from underground water and therefore did not necessarily require flowing water to have existed on Mars’ surface, Nicolas argued that presence of dendritic (finger-like) channels leading up to some of the best developed valleys was clear evidence they were formed by surface water that was sourced from precipitation. “But what is the nature of this precipitation, and what does it imply about ancient Mars’ climate?” Nicolas wondered. If the valleys were fed through rainwater, this would suggest that the climate of Mars at the time of the valley formation had to be warm enough to support liquid water. However, the valleys would look the same if they were shaped by precipitation from snow and subsequent melting, and if this were the case, Mars need not have been warm in the past. Nicolas argued that understanding the issue of whether these features formed through rain vs. snowmelt was an important problem for the community to address. Large swaths of Mars' southern highlands are dissected by branching valley networks like the one in this Mars Reconnaissance Orbiter Context Camera photo. The number of craters that overlie them suggest that the valley networks are quite ancient. This image covers an area about 30 kilometers east-west by 60 kilometers north-south. We have observed other types of fluvial landforms on Mars that are associated with slightly younger terrains (~3.7 – 3.3 billion years old), including delta fans (like Ebderswalde and Jerezo Crater) and alluvial fans (like in Gale Crater). These features are caused when channels of water are deposited into standing bodies of liquid water, so their presence is more suggestive of a liquid water-supporting climate in Mars’ history than the fluvial valleys. Since we only see these kinds of landforms in more recent terrains on Mars, does this imply that this was the only time period when Mars’ climate was warm and wet? No, Nicolas argued. Alluvial fans and deltas may have formed earlier in Mars’ history, but were covered by more recent lava flows, making them impossible to spy from orbit. It’s also not entirely clear how long bodies of water would have existed or what governed their distribution across the surface of Mars. Are they relics from a time was Mars was globally warm, or do they represent areas of local, limited warming that occurred during periods of high obliquity or regional heat sources? Nicolas concluded by saying there are still big questions that future missions need to address to help use geomorphic evidence to more definitively interpret past the climate of Mars. Last, Bob Haberle present the point of view of Mars’ ancient climate as told by atmospheric models. Understanding how the atmosphere affects the surface temperature of Mars first starts with an understanding of how the planet formed and what that implies about the gasses that would make up an early atmosphere. Bob explained the current thinking is that the core of Mars formed fast, within 10 millions of Mars’ accretion, and it incorporated a lot of iron during its formation, leaving behind the more volatile phases like water (H2O), carbon dioxide (CO2), and nitrogen (N2) in the planet’s molten mantle. These phases were later outgassed through volcanism to form Mars’ atmosphere. Additional gases such as H2O would have also been added to the atmosphere through impacts, a frequent event in the earliest days of the solar system. Once modelers figure out a likely composition for the ancient Martian atmosphere, they can then calculate how thick that atmosphere would have needed to be in order to heat the surface to be warm enough to support liquid water. The presence of an atmosphere can be a huge contributor to the surface temperature of planet. On Venus, the presence of an atmosphere heats the surface an additional ~500˚ C while on Earth, the atmosphere warms our planet’s surface by a more temperate ~30˚ C.
In addition to estimate the composition of ancient Mars’ atmosphere, modelers also needed to consider that the 4 billion years ago, our sun was only three-quarters as bright as it is today. This means there was less sunlight available to warm Mars’ surface, which Bob explained would have resulted in an average surface temperature on an atmosphere-less Mars of a chilly -77˚ C (recall, without the addition of any salts or thin films, water needs a temperature of 0˚ C to be liquid). Models have shown that it is possible to add an atmosphere to warm Mars to just above above freezing even with a faint young sun, but it’s very difficult to do without invoking special processes that may or may not be physically realistic. One way to model a warm, wet early Mars is to add lots of greenhouse gases, like sulfur dioxide (SO2) or hydrogen (H2) into the ancient Martian atmosphere. However, it’s not clear how long these gases would stick around or what sorts of feedback loops would occur when you add them; some feedback loops could actually make the planet colder. Bob then went on to explain that it’s much easier to model a Mars that was transiently warm and wet rather than continuously warm and wet. He described some recent modeling work that has shown impacts could deliver enough heat and energy to account for a warming that would produce up to 650 m of rainfall in the Martian highlands, and large swings in Mars’ obliquity could also episodically warm things up. I think the conclusion of all three of these talks was that we’ve gathered a lot of new evidence to improve our understanding of ancient Mars’ climate over the last seven years, but we still have a long way to go before being able to tell the definitive story. Watching these three talks all in a row really emphasized to me how solving this problem will be a truly interdisciplinary undertaking. Only by working together will atmospheric dynamicists, geochemists, and geomorphologists be able to gather the evidence to paint a clearer picture of global climate change early in Mars’ history. I wonder how the MSL findings have changed this viewpoint. For instance, hasn't MLS found phyllosilicates (at John Klein for instance) in the dill samples that may not have been detectable from CRISM because of its coating of dust? Could CRISM be under-estimating the amount of clay because of the dust layer? Thanks for the good report from the meeting. How would the Southern hemisphere ocean that ESA has found factor in? They believe (last I read) that there is enough water to cover the entire planet under several meters. Could this be episodic as some suggest or just pockets of scattered different geologic and ecological systems? If no, why no? Our planet is that way, polar ice, desert, tropical, and so on. As Fred T. point out, MSL findings. I add, MER A & B water related findings.... acidic and neutral, and signs of neutral water at MSL site(s) recently. This is a good report you wrote on because it asks questions that some probably thought we don't need to ask. Now ground truth data says "Hold on there, ask!" It would be nice to see a follow up with these scientists as a not to distant date. Yes, how exactly does the Northern Hemispheres 'ocean' fit into this recent picture?